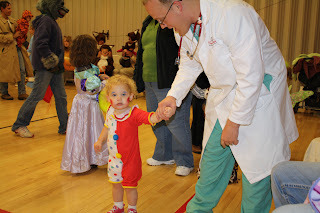 This was the first year Heather was able to really appreciate the fun of Halloween. Our ward had a trunk-or-treat activity on Wednesday, and despite wind and cold, they kept most of the activity outside. the excitement of decorated cars and excessive amounts of candy gave the kids (and adults) enough gumption to brave the blast. Heather was a clown and mom wore her 50s poodle skirt. Heather again with daddy in his doctor outfit. Halloween itself fell on Sunday this year, and the die-hard Iowa State fans would never be happy if they had to choose between trick-or-treating and a Cyclone football game on Saturday night, so the community decided to celebrate Halloween and do trick-or-treating on Friday night. Our neck of the woods didn't get much action for some reason though. Oh well, Heather really enjoyed the 5-10 houses we went to. 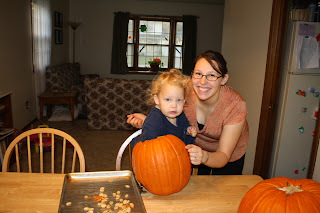 Scooping out the pumpkins with mommy. We miss doing this tradition with family! 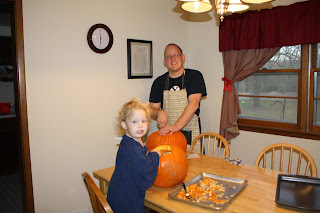 Heather scoopin' and daddy carvin'. You can see the nice window treatments Stephanie finished sewing the other day. 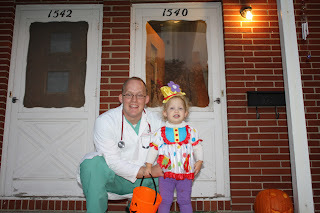 Daddy and Heather going out for trick-or-treating, daddy as a doctor and Heather wearing a different clown costume! 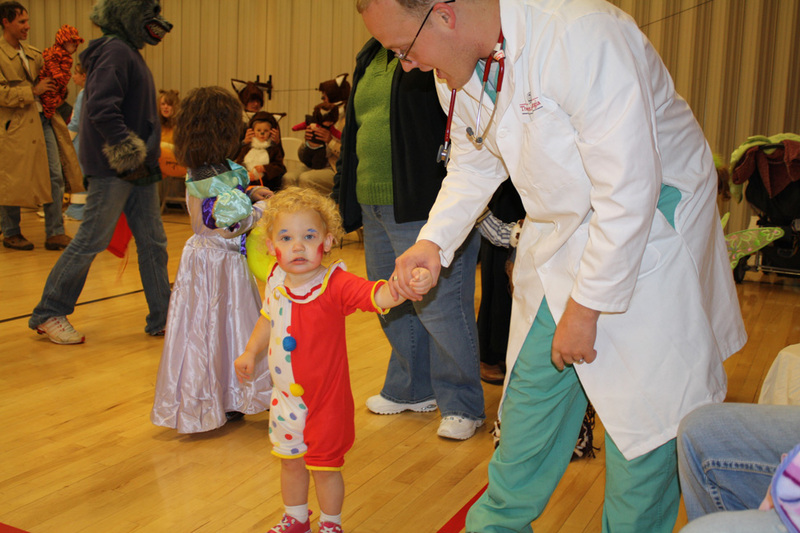 We hope you all had a fun Halloween! Don't start your Christmas music too early now, we've still got Thanksgiving to celebrate! Cute Halloween costumes! You guys are so cute! Love Ya! So Cute! Congrats on the boy! So glad you guys had a fun (albeit frigid) Halloween! Neat to see Heather braving the slimy pumpkin pulp! Rachel & Maren refused to touch it this year, but Michael totally got into it. He & Heather would have a great time emptying out pumpkin guts next Halloween together! (If we end up moving closer.) We're excited to have you over for Thanksgiving! The countdown is on!!! 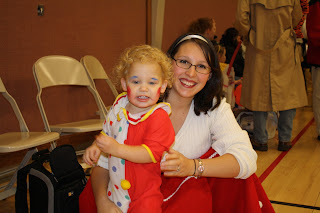 I have a clown costume too, most of my boys spent a Halloween as a clown. Too cute!